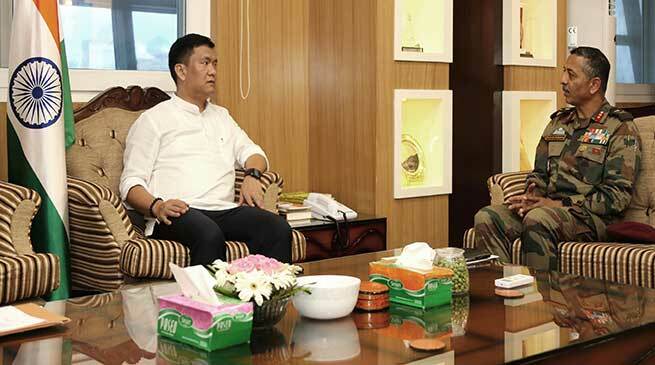 The Arunachal Chief Minister Pema Khandu welcomed Indian Army’s development initiative in the state and said that Tawang is developed because of them. He also said people of Arunachal and the Indian Army share special bond. He share his views with 56 Infantry Division GOC Major General Ashok Dhingra called on Chief Minister to discuss on various defence issues related in the state. The meeting further discussed on defence land acquisition in the state with the Chief Minister assuring that all such cases will be taken cared. He said the state government in cooperation with the centre is trying best to compensate the local people on lands wherever acquired by the defence establishment. The Chief Minister welcomed the decision for a Sainik School in the state and said that it will bring people of the frontier state closer to the Army and youths of the state will find new career opportunities in the defence forces. The Army General informed about various development and welfare activities undertaken by the Indian Army in the border areas. He informed that the Army also plans to open schools for border people with support from local community. The meeting was also attended by Principal Secretary Satya Gopal.